I had very good luck with students most years-- I would develop a bond with them quickly, and they rarely were outright defiant or indignant over doing a task. However, there were a few things that, no matter how well I got along with the kids or how much they liked my class, led to an argument (at least in the beginning of the year--but more on that later). One of those was presentations. I don’t think any assigned task created as much instant dread as presentations, and so they were often the hardest part of a SOLE. If students are unused to presenting, they are nervous and often extremely resistant. Even if they’re not, most are uncomfortable with presenting something they have created in one hour. They push back, and often the initial presentations are less than stellar. 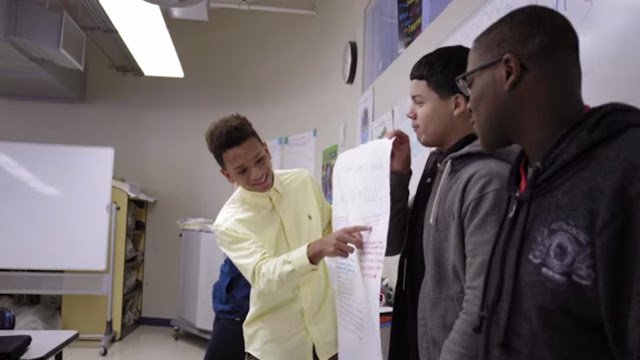 Some teachers, when they’re new to SOLE, might question why we do this--when students are so excited to do the research and collaboration, why force them to present if they’re uncomfortable? My first (and to me, most important) answer to that is: SOLEs help them get comfortable with presenting. Having worked at MC2 STEM, presentations were an expectation, but they were often in front of much larger groups than just one class. On the smaller scale, students might present to a few professionals--on the larger, students had to perform in front of an auditorium full of people. Obviously, expecting students to just have the skills to do this without practice is impractical, but presentations were often long projects, and not every class had the time to devote to them. Enter SOLE, where a presentation took only one hour. Students week after week presenting, interacting, taking questions, occasionally having mishaps and learning to work through them, and doing all of that consistently. In a few short weeks, students no longer were complaining. In a few more, their presentation skills skyrocketed. There was no more shuffling, laughing, shyly reading off a paper, etc. And the really good news was that they became so comfortable presenting in front of their class that presenting in front of other people was no longer a task worthy of sheer terror. Sure, they got nervous, but it wasn’t so seemingly far-fetched. Not to mention, with practice students got excited to present-- they wanted to share their information in new and creative ways, and so presentations became more and more engaging. In addition, being able to present is a life-long skill--I can’t think of any industries where you never need to present. When I was in college working at a Dollar General, I still had to prepare a safety presentation to give to our staff. For my senior thesis, I had to pitch my idea to a board of professors in my department. More and more, presenting is reaching into every industry--According to Forbes.com, 70% of Americans agree that presentation skills are critical to their success at work. However, in that same article, they cite that 20% say they’ll do anything to get out of a presentation, including feigning illness, even if it means “losing respect” in the workplace. What this says to me is that we need to prepare students for this. If they’re comfortable presenting, they’re already one step ahead of those who aren’t. They might resist at first-- this article shows us that even adults will-- but in the long run, it’s so beneficial to them that we can’t ignore this vital step in SOLEs. Practice makes perfect, after all.